Go check out Irish-American Witchcraft: Dressing Old Gods in a New World . This is a fantastic post that addresses a lot of important issues for both that path and a wide variety of others. I have to stand up and shout YES!!! I am always saying in regards to Deitsch culture: we should refer to it in the present tense. We should say “Deitsch culture IS” not “Deitsch culture was”. While all of us who are drawn to reconstructionist or revivalist paths have some romanticizing of the past going on, it’s important for the survival of our religions to have living traditions, alive, present, thriving, and relevant today without breaking ties to the past. One point the author of this post brings up is especially important: ancient Pagans were not trying to reach back to the past. While they certainly honored their Ancestors and kept Their stories alive, they also used the most modern of everything that was available to them–not just clothing, but also housing, tools, technologies, modes of transportation, and more. 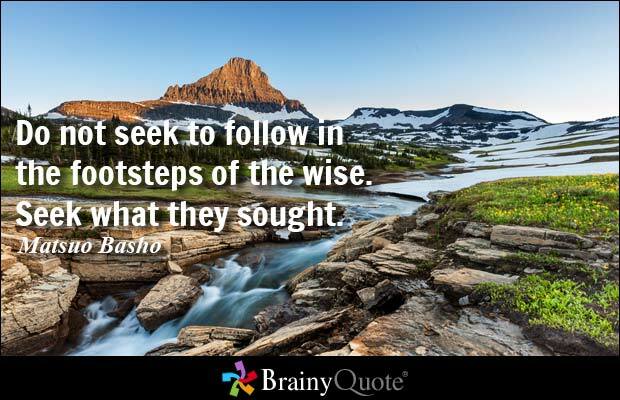 There’s a quote from Basho that I feel is really applicable here: “Do not seek to follow in the footsteps of the wise. Seek what they sought.” We will better understand the spirit of our Ancestors’ practices (and, come to think of it, the literal spirits of our Ancestors) if we don’t simply copy exactly what they did, but instead look at what they were trying to achieve. What were their ideals? What inspired them? It’s become popular to criticize people of the past using modern standards of morality, politics, and interpersonal relations. But modern polytheists shouldn’t be looking to mindlessly imitate the lives of the ancients. That’s missing the point. The value in the past is to both learn from the mistakes and take what was the most worthy, noble, and meaningful from that accumulated experience and bring it here into our times. In Urglaawe, one example of the ways that we bring the best of the past forward is with the virtues. In many Heathen traditions there are nine, but in Urglaawe there are 18: Discipline, Perseverance/Steadfastness, Honor, Courage, Industriousness, Self-Reliance, Fidelity/Troth, Hospitality, Truth, Generosity, Spirituality, Compassion, Curiosity, Introspection, Self-Improvement, Stewardship, Kinship, Wisdom. Was there some explicit list of these, either in Pennsylvania Dutch households of about 250 years ago, or in ancient Viking homes thousands of years ago? Certainly not. Listing the virtues is a modern idea, designed for the convenience and betterment of modern lives. But, by going back into the history and stories of the past, we are able to to find what these people were seeking, what was worthy, noble, and meaningful in their lives. By making a list of these ideas to meditate upon and practice in our own lives, we bring those concepts into the present, and we value them. We make them live again. This is only one example but a powerful one. It may seem odd to bring up such deep topics related to clothing. After all, the way each of us sees the Gods is very personal, and the Gods aren’t really limited by things like physical appearance anyway, so why does it matter? I think there’s one very important thing that matters here: seeing the Gods in modern dress lets us see Them as here with us, living, now, in the present. That mental shift makes all the difference when we are trying to make our traditions live and breathe again, and it’s probably an idea most of us haven’t even considered. I for one have an altar covered with images and tools from days gone by, none of which I’m planning on getting rid of anytime soon. I love historic re-enactment, and I’m bonkers for antiquing. There’s nothing wrong with the outer trappings of the past. But this fabulous article can serve as a gentle, friendly wake-up call for our community to give the Gods a place in the here and now too.